Learning with Legos: MCC Space and Environment class explores Mars. Learning with Legos: MCC Space and Environment class explores Mars. #MasonCountyEducation. By Rob Alway, Editor-in-Chief. SCOTTVILLE — Students in the Mason County Central Space and Environment Class have been learning what colonization could be like on Mars. Over the past several weeks, freshman-level class, taught by Mike Weinert, has been working in groups, studying the necessary survival tools that would be necessary for when humans inhabit the planet. The groups were divided into seven categories: exploration, research, medical, agriculture, headquarters, living area, and energy. The students within the group then took on specific tasks with the goal of presenting their projects to their classmates. Students created blueprints of structures and then, using Lego blocks, created 3-D models of those buildings. Some of the students within each group researched the logistics of their assigned category. “This is the first time we have used the Lego blocks in combination with a project such as this,” Weinert said. A lot of the students really put a lot of time and creativity into this. 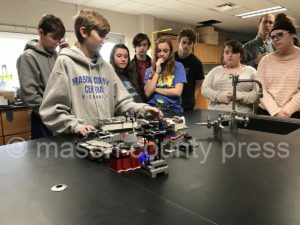 This is a great example of project based learning taking place in our school.” Weinert said most of the Lego blocks were purchased through a grant from the MCC Educational … Continue reading Learning with Legos: MCC Space and Environment class explores Mars.